It seems that I lost a couple of years since the last chapter. I had been sharing shop space with a couple of friends, see here, but kept the Prefect at home while doing all the stuff in the last few chapters. After a time, that partnership broke up and, not being able to afford the rent on 2000 square feet, I moved all my projects to a self-storage unit. It was a fairly nice 20x30 foot space with overhead doors at each end. In fact, it was another unit in the same facility where I finished the restoration of Joe Hobbs's Mercedes a few years ago. Although it seemed like a workable solution at the time I actually accomplished very little on the car during the two years there. I did work on the seats and other upholstery at home but that is a subject for another chapter. These photos are of the original shared shop. 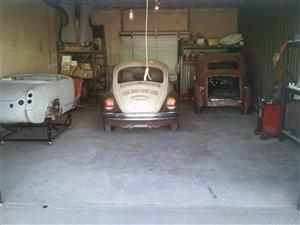 The Volkswagen is Judy's, see here and the white Mercedes is our old 450SE. 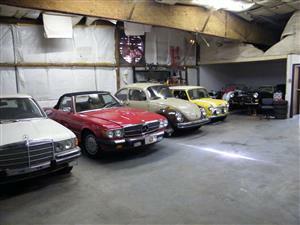 I have since given the Mercedes to my son when I moved to the storage unit as there was not enough space for it there. The Sprite on the dolly is mine, described here. The Prefect was never at this location. The others are owned by my partners. 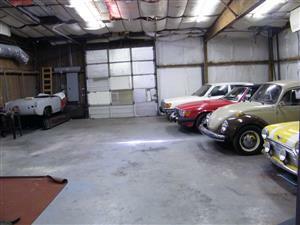 There is also a new MGB not shown in these photos. Over the three years we were there, several more cars came and went. This shop is where I Built the custom components for the clutch and petrol tank in the previous chapter. A few short months ago the situation changed. 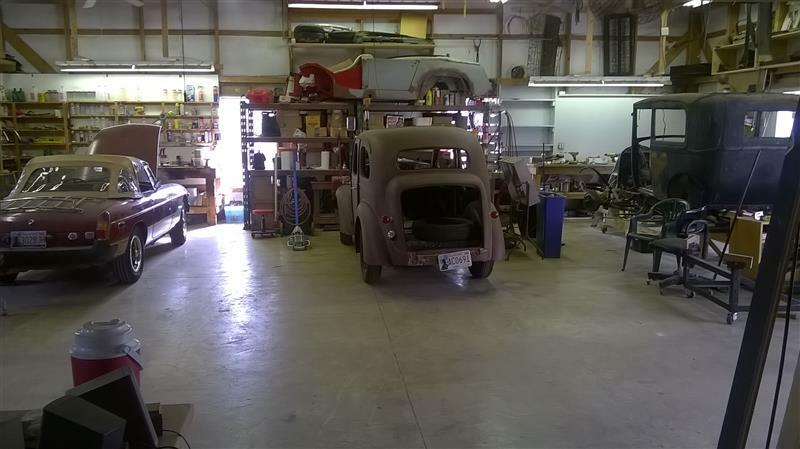 A couple of brothers, old friends, built a very nice shop building several years ago and they offered me some work space in it. 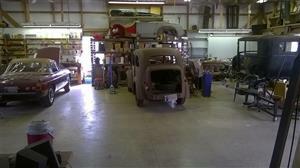 The brothers both have project cars and the space devoted to cars is about 40x40 feet. I don't have quite as much space as I had but still workable, plenty of room for my storage shelves and space to work on one car or park two. The shop has plenty of windows and lights, a loo, forced air heat and a burglar alarm. I expect to get a lot done there. Actually, I feel like I have already accomplished significantly more than I managed in the several years at either of the previous two locations. The left photo is of the storage unit and the other is the Prefect in its new location with a nice daily driver MGB on one side and a Ford Model A on the other. The Model A was a fully restored, parade car but was the victim of a garage fire a few years ago. It is now being restored again. That is my Sprite on top of the shelves, the same location it had in my garage years ago. There is also a very nicely restored Morris Minor drop head in a separate room of the building. Ok, I have digressed. This chapter was supposed to be about "making it run" again. I had a full month to move from the storage facility to my new home. Most of that time was used moving the shelving units and all the spare parts for all three cars. when it got down to the last week, the only thing left was the Prefect. I estimated I had plenty of time to get it running and drive it to its new home. After all, I had done the preliminary stuff in the last chapter. That was the goal anyway. I of course once again checked the oil, removed the spark plugs and squirted a little oil down the holes. Then I cranked on the starter until the gauge showed over 10 psi of oil pressure. That done, I put a gallon of petrol in the tank and hit the switch to prime the system. After many seconds, I determined that no fuel was being delivered to the carburetor. There is a second, see-through filter at the mechanical pump on the engine that was still empty. After a few tries, I decided to remove the electric, priming pump to diagnose why it seemed to be not pumping as it did make the usual noise. When I opened it up, I found the diaphram had virtually melted into a sticky, black glob. It being a cheap pump, I discarded it and bought a new Facit pump. These pumps seem to be fairly popular with LBC owners as replacements for the fairly expensive SU originals. Since this pump is intended to run only long enough to fill the carburetor then switch off, the fact that they don't go silent when pressured like the solenoid types is not a problem. Unfortunately, the way I chose to mount the pump and pre-filter is not very conducive to changing components. It took the better part of a day to make the changes necessary and mount the new pump. Even then, it will not be suitable long term. I will have to remove it once more and remake the rubber mount from another old tire. With the new pump finally in place, I again hit the switch and watched for the visual filter to fill up. It shortly did then the mechanical pump immediately started dumping fuel onto the floor. It looks like its diaphram is rubbish also. Well, no big problem. I would just plumb around it and let the electric pump feed the carburetor directly long enough to get to the new shop where I would rebuild the mechanical pump. There is a pipe from the mechanical pump directly to the carb that I wanted to keep for later use so I went to the hardware store to make up a temporary pipe from the filter to the carb. It turns out that the fittings must be made from that rare material, unobtanium, as nothing in current brass fittings will mate up to the carb. I had to cut the pipe to attach a hose from the filter after all. With that done, I was pretty sure we were ready to start. I again switched on the electric pump and watched for the carburetor to fill up which it did shortly. The next problem was that it did not stop there. The needle valve failed and the pump continued pumping fuel out the overflow, which is also the atmosphere port right in the throat. Although I got the lowest pressure pump available, 2-4 psi, I wasn't sure whether it was too much pressure or the valve just didn't seat. I took the top off the float bowl and lowered the float about 1/16 inch and reassembled. As luck would have it, that cured the overflow problem. With fuel finally being delivered, it still would not start. The next step was to check the electrical system. I did not have any diagnostic tools with me but this is a really simple system. Seat-of-the-pants diagnosis should be adequate. I looked at the points. The gap was all right and they were slightly tarnished but didn't seem too bad. There was voltage at the distributor and I disconnected the condenser just to be sure it was not shorted internally. A couple of times, I thought I heard it pop but no attempt to start or even give any hope that it might. Finally, I took the points home to file them down and polish the tarnish. By this time, I had lost another day. Would try again tomorrow. Sure enough, I reinstalled the points, switched on the fuel pump and hit the starter switch. It started almost quicker than I could get my finger off the switch. Success finally. It ran for several seconds, maybe a minute, then quit and would not start again. I had forgotten that the fuel pump and starter are two, mutually-exclusive positions of the same switch. This was all right for how the electric pump was intended to be used but I have to remember to switch the pump back on after starting. With it now running and showing good oil pressure, I decided to fill the cooling system and bring it up to proper operating temperature. Remember way back in Chapter I the problem with coolant left in a system for years. So it had been left dry. Over several minutes, it slowly climbed to 180 deg which is the thermostat rating. But it did not stop there. It continued to climb to 200 at which point I shut it down. There has always been one quirk with its cooling with this replacement engine. The temperature tends to hold fairly steady at 180 for a while then slowly climb to 195 or so before quickly dropping back to 180 and starting the cycle over again repeatedly. For that reason I wasn't too concerned yet. After letting it set for about a half hour, I started it again. I figured that if the thermostat had finally opened, the temperature should almost immediately drop back to 180. It did not, however. With only one day left on my lease, I decided to get the tow dolly and tow it to the new shop after all. Once in the new home, I replaced the thermostat with one rated at 160 deg instead of 180 figuring that it will probably still fluctuate like before and I would rather have it stay below 180 instead of climbing to 195 and back. I also reconfigured the mounting for the fuel pump to a more suitable form. Next, I wanted to flush the cooling system so pushed it outside, added the can of flush and let it run for about 45 minutes. The flush recommended running it a couple of days for a car that has not been run in a long time. I opted to flush on two consecutive days instead. 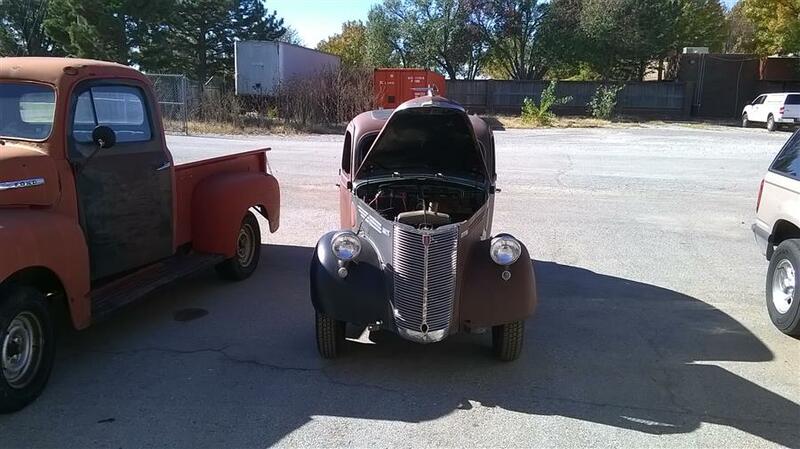 The photo is of the Prefect, next to a '50 Ford Pickup, outside while flushing. This gives some idea of the actual size of it relative to the Ford. Interestingly, both days, the temperature slowly climbed to 160 degrees but never fluctuated at all from that point. I guess that "quirk" was the fault of the original thermostat all along. With it finally running apparently pretty reliably, I really wanted to drive it at least a little bit. Remember it has been 18 years since it was last driven. I also wanted it in a condition where I could move it in the shop under its own power instead of having to always push it. To that end, it needed a seat. 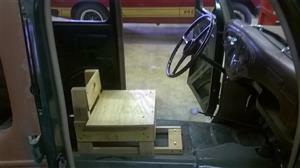 The front seat is fully upholstered and ready to install. The car has no glass, shops are not necessarily the cleanest of environments and there is still a lot of work to be done resulting in dirty trousers. It seemed imprudent to install a finished seat at that time. The photo shows my temporary solution, thanks to a 2x4 and some plywood scraps. It is not the most comfortable of seats but it does get the designed job done. 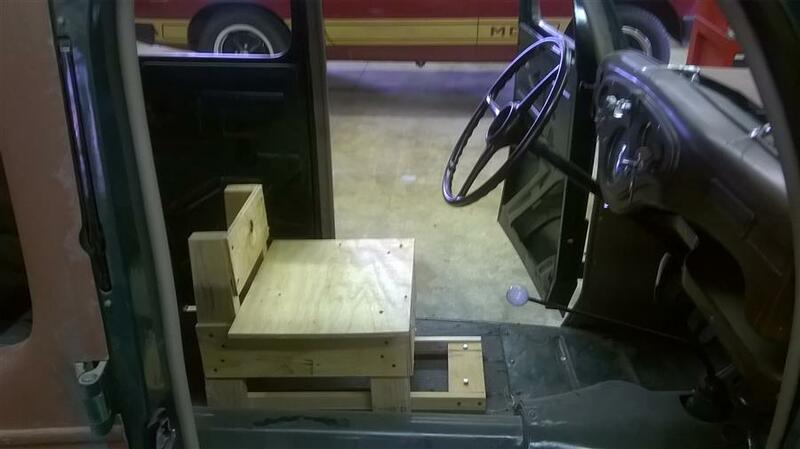 With the temporary seat installed, and having a relatively nice day, I actually drove the Prefect around the block. This was the first drive in 18 years. By now it was the middle of December 2016 and the weather was about to turn for the worse. It is time to start on the remaining body repairs and do whatever is needed to get the fuel supply system finished. But that is for the next chapter. See Chapter VIII - What's Next?